Fig. 175.—Enlarged Section through Part of Dinner Waggon Bottom. for fillets, etc. The interior and the backs mav be of deal ; the bottom is edged with a 2-in. slip of hardwood : the foot pieces. 2 J in. by 1 in., are glued on to the edges of the ends. Figs. 155 to 15* are printed 1 in. = 1 ft. ; Figs. 160 and 163 are 3 in. = 1 ft. : Figs 159 and 162 are 2 in. = 1 ft. : and Figs. 161 and 162 are half full size (approximate). So many exact dimension« are given in the illustrations that it is an easy matter to construct accurate scales. Fig. 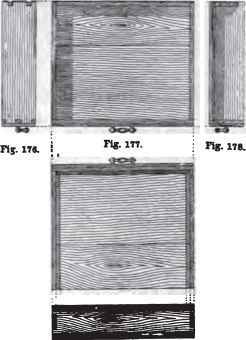 164 is an enlarged vertical section through the bottom part of the sideboard. Figs. 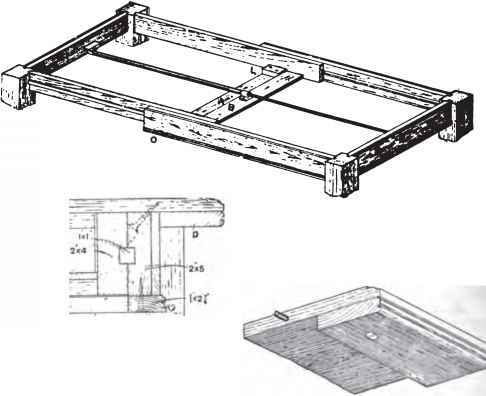 176 to 180.—End Elevation, Plan, Croaa Section, Underneath Plan, and Back Elevation of Dinner Waggon Drawer. section through the shelf level is shown by Fig. 171; details of construction are illustrated in the sectional views (Figs. 172 to 175); whilst full particulars of the drawers are given in Figs. 176 to 180. Figs. 165 to 171 are reproduced to a scale of 1 in. =1 ft., as are also the views of the drawer above.